Captain Larsen announced we would be cruising through some of the almost 30,000 islands that make up the Swedish archipelago about 3 AM, as we made our way towards Stockholm. Not wanting to miss out, I set the alarm to wake up my cruise mates. 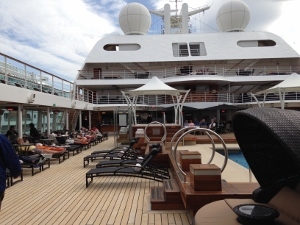 We bundled up in Seabourn’s plush white robes, and headed to the top deck to see the ship navigate many of the outer islands of Sweden. It was as light as mid-day. We saw some uninhabited islands, but most had Falon red summer cottages, and all manner of boats on them. The Swedes seem to love the water, and think nothing of living a few islands away from the center of activity. Island after island, we watched with wonder. There was even a sailboat out in the middle of the early morning hours. We heard that during the winter there is a skating race from island to island. Sweden is 1/3 water, 1/3 canals and harbors, and 1/3 land. 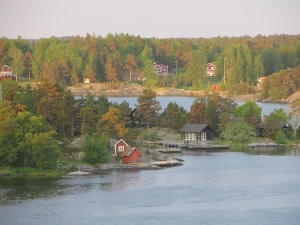 We approached Stockholm which is made up of 14 islands linked together by bridges. We stepped off our Seabourn cruise ship, and caught a taxi into town. Our driver explained that we arrived just in time for the National Holiday festivities! 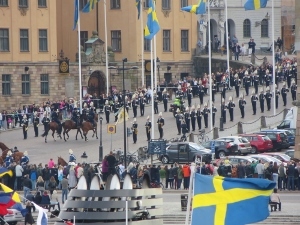 Swedes celebrate their National Day in honor of King Gustav Vasa’s election in 1523, and the country’s 1809 constitution – both events took place on June 6th. 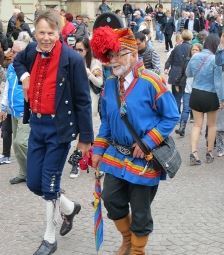 Many dress in traditional Swedish outfits, many waving the Swedish flag, many celebrating. Before the day was out, we were able to watch the Royal parade–streets thronged with people cheering. VASA Museum: First on our list of things to do in Stockholm–VASA is a huge oak carved battle ship that was built for the King in 1628. It took three years to build. It sunk on its maiden voyage, before it was out of the channel. All aboard perished. It stayed there for 333 years. Salvaged in 1961, it took the Swedes 3 years to excavate it from the ocean floor and 10 more years to conserve it. We admired the size and well-preserved craftsmanship of this ship from 3 levels. The front and back of the ship bear the coat of arms for King Gustavus Adophus II. Skansen: Stockholm’s open-air museum dates back to 1891 where you can see how the Swedes lived and worked in the old days. There are 150 historical buildings that have been moved to the museum dating back to the 18th century. There are festivities, markets, folk dancing, and crafts demonstrations, where people wear traditional dress. A fun attraction for families with children. Royal Palace “Kungligan Slottet”: Built in 1754–it is the largest castle in Europe still in use with 608 rooms! Although the Official Residence of His Majesty the King, the Royal family now lives in Drottningholm, in the countryside. The Palace is open to the public and offers no less than five museums. The Palace was largely built during the eighteenth century in the Italian Baroque style, on the spot where the “Tre Kronor” castle burned down in 1697. Make sure not to miss the parade of soldiers and the daily changing of the guard. We also visited Slottskyrkan, the Royal Chapel, and listened to a harpsichord concert. Beautiful. This is a must on our list of things to do in Stockholm! 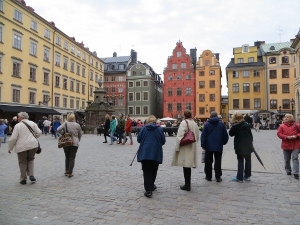 Gamla Stan: We strolled through the “Old Town” where you’ll find the oldest square and street in Stockholm. 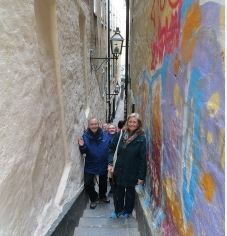 Walk the narrow alleyways and cobblestoned lanes, and you’ll find cafes, boutiques with local handicrafts. Don’t Miss! 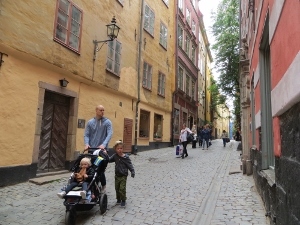 Mårten Trotzigs Alley, narrowest in Gamla Stan, just 3 feet wide at its narrowest point. National Museum of Fine Arts: Impressive collection of art, including works by El Greco, Rubens, Rembrandt, and etchings by Carl Larsson, Anders Zorn. The museum is undergoing renovation and won’t reopen til 2017, so we want to return to see it! 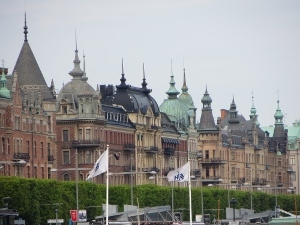 Parliament House: You can see the classical building of the Parliament House located on the small island Helgeandsholmen, connected by bridges to the Royal Palace and the modern city center. 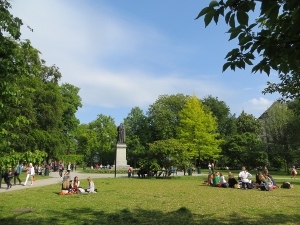 Royal Gardens: We walked through the Royal Gardens and noticed lots of locals and visitors basking in the summer sun. City Hall: The most significant building in the skyline with three golden crowns on top. You can climb the tower for panoramic views of the city. Don’t Miss! The Golden Hall decorated with 18+ gold mosaic pieces! Abba the Museum: We heard you “walk in, and dance out” – this museum tells ABBA’s story with music, lyrics, and costumes. You can visit the Swedish Music Hall of Fame nearby too. On our list for the next visit to Stockholm. Drottningholm: In 1981, the Royal family built another palace called “Drottningholm” just outside the city of Stockholm so that the children could experience greenery, growing a garden–a more bucolic way of living. It’s name literally means, “Weed Hall–or a place of weeds.” It has an English park and a Baroque style garden. 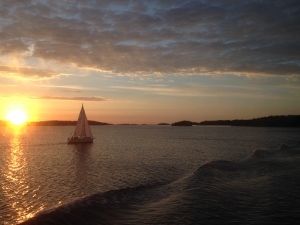 Stockholm Archipelago: Lastly on our list of things to do in Stockholm– You can ferry out to one of the islands in the archipelago on a day trip, or stay overnight. Beautiful scenery and many locals go here to find serenity. We felt lucky to visit Stockholm on National Day! Lots of families, friends of all ages walking about in Stockholm, celebrating together. More than 50 bands or musical groups playing in various town corners. 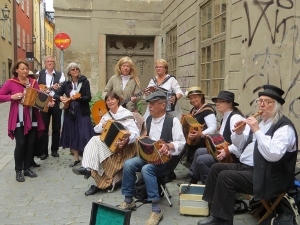 We stopped to watch an older group of musicians dressed in traditional clothing with accordions, guitars, mandolins. 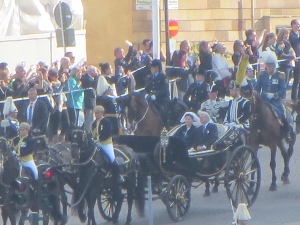 We saw the Royal band, the Royal horses and Royal family riding in a carriage–children waving flags. What a great day for this country and its people! 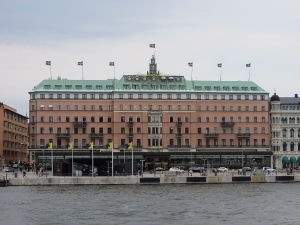 Grand Hotel Stockholm A luxury 5-star hotel, member of LHW, catering to royalty, celebrities, and high-profile guests since 1874, and known to host Nobel Prize winners. Many refer to the Grand Hotel as Sweden’s finest hotel, where guests receive outstanding hospitality. 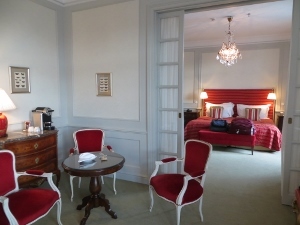 Our rooms at the Grand Hotel were “GRAND”, spacious, similar to a 2 bedroom apartment with a balcony and deck. We watched the harbor activity, and looked out to the Royal Palace to see the National Day Festivities. Ideal location to stay in Stockholm and central to everything as you hit the top things to do in Stockholm! As part our things to do in Stockholm list here is our favorite place to eat! The Veranda Located on the main floor of the Grand Hotel, The Veranda is a favorite place to dine for locals and tourists. We dined here twice, and enjoyed the views of the waterfront and the Royal Palace. We dined on their legendary Swedish Smörgåsbord, where you can choose from a variety of 100 dishes like Swedish meatballs, a variety of healthy salads, and numerous desserts. The next morning, the traditional Swedish breakfast presented more options – fresh vegetables and fruit, yogurts, cream of wheat/oatmeal, pastries, or salmon, herring, caviar, sausages, cheeses and crackers. Don’t miss! The pumpernickel bread is delicious. 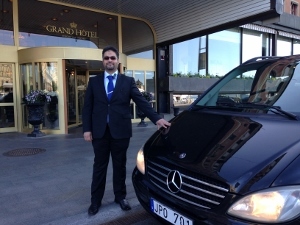 Limos 4 Stockholm provides airport transfers, sightseeing and other transportation service in and around Stockholm or anywhere in Sweden. They provide excellent service and a fleet of cars to choose from: business & luxury – sedans, stretch limos, minivans, buses. 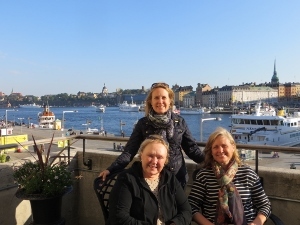 Global Adventuress would like to thank Grand Hotel Stockholm for hosting our dinner, and Limos 4 Stockholm for our airport transfer, and the Stockholm Office of Tourism for guiding a tour. We also would thank Travelpro for the carry-on spinner suitcase, a favorite of travel crews and avid travelers, as well as DK Travel for the Top 10 Stockholm travel guide. Stockholm Tourism Office: To help you plan your travels to Stockholm and the surrounding area, visit this site.